Among the list of #1 priorities for the engineers here, and all their jobs are #1 priorities when making up a whole functioning civilization from practically nothing, was theater areas. They have multiple uses, not just entertainment, but today this one was dedicated to fun. Curving rows of stout benches, most with straight board backs, run in semicircles up a terraced curving hill side. They arc almost 180 degrees around a tall Quonset-hut-style building at the bottom of the strategically chosen hill. A stage platform extends twenty feet out from the building about four feet off the ground. Everyone has a good view when the performers come out. My companions took over a block of bench space about twenty rows back from the front. The rain took a break just then and most men took off their ponchos before settling in. Down front the usual “bald headed row” of high ranking officers and VIPs showed themselves true to form, reflecting some of the bright gray sky in the middle of a sea of olive green. I kept my own hat on as I walked down to the stage. Most of the performers tonight were the friends I made back in Honolulu, crossing paths again with them on Guam. I pulled rank to get back stage, showing my press ID, and got to catch up with them again before their second show of the day. For my money, not that I was spending any, the centerpiece of the show was pianist Arthur Zepp. He supported every act in the show, and in the middle took center stage for a couple solo pieces. The troops heard comedy from Dell Chain and songs from Emma Lou Welch. 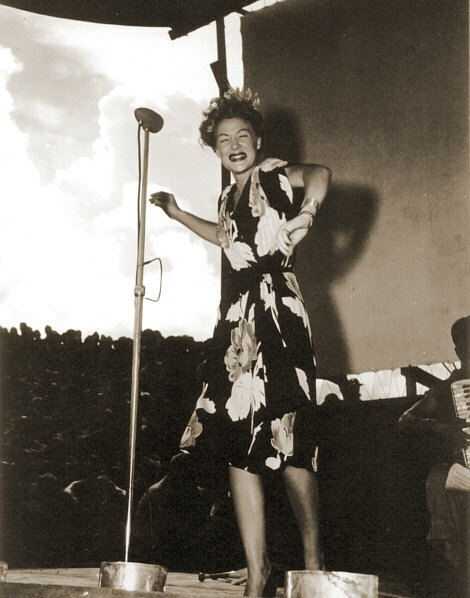 Virginia Carroll also sang, but what got the troops to sit up and lean in was her acrobatic act. The headliner was the surprisingly funny Betty Hutton. She sang until they drug her off stage, and I had a side stage view of all of it.